In March of 2001, I began a series of drawings entitled Smoke. Six months later, planes flew into the World Trade Center and the Pentagon, killing more than three thousand. 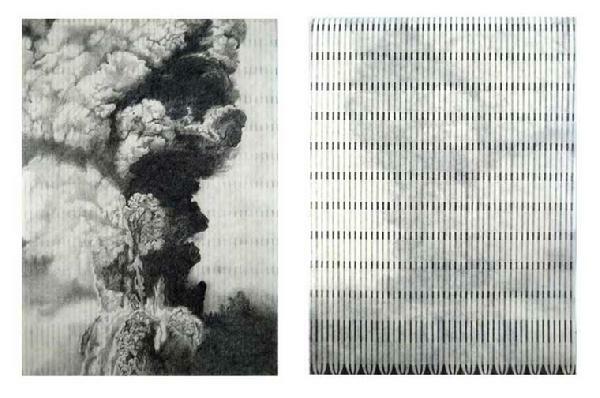 Watching in real time the television images of smoke billowing from buildings in New York and Washington D.C., and then later from the bombed desert landscape in Afghanistan, there was a compelling synchronicity with the smoke drawings on my studio walls. Violent events beginning with those of September 11th have, for nearly a decade, influenced and informed my work. Smoke V (New York), 2002. Graphite on mulberry paper (recto/verso), 25 ¼” x 18″ (both sides). Collateral Damage 2001, 2002-2004. 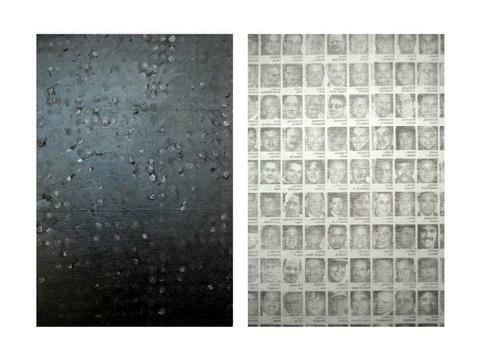 Acrylic, gunpowder, newsprint, ink transfer, fingerprints, polymer on gypsum, two 34″ x 48″ panels. 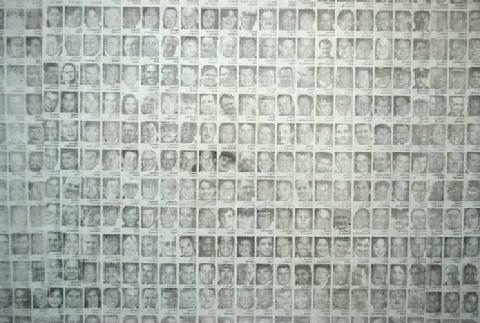 To create this diptych, I transferred the faces of the September 11th victims (published by the New York Times on the first anniversary) onto gypsum panel. Pressing gently on the reverse of these newspaper photographs with ballpoint pen, I have imprinted each individual as a ghost-like presence against this white backdrop. The paired panel is papered with the discarded pages of this process. Ink has rendered the original image illegible, and the dark expanse of this field stands in stark contrast to the lighter panel. On top of this surface, I placed the imprint of my own body these fingerprints parallel the gridded faces opposite, meditatively marking the equivalent number of civilians killed in retaliation with the first U.S. bombing of Afghanistan. Below are details of this work. Please click on each to enlarge the image.